We are always looking for science-driven individuals. If you are interested in joining the lab contact us. Dr. Romero is an Associate Professor of Bioengineering at the University of Texas at Dallas (UTD) and adjunct faculty in the Surgery department at the University of Texas Southwestern Medical Center (UTSW), the UTA Research Institute (UTARI) and Partner Researcher at the University of Wollongong, Australia. He received his doctorate in Neuroscience from Tulane University and postdoctoral training from UTSW as Associate Member of the Christopher Reeve Paralysis Foundation Research Consortium on Spinal Cord Injury. He has served as Director of the Regenerative Neurobiology Research Division at Texas Scottish Rite Hospital and Assistant Professor of Neurology and Plastic Surgery at UTSW. He serves as Associate Editor of Frontiers in Neuroengineering and as Founder and Chief Scientific Officer for Nerve Solutions Inc, a company that commercializes the Biosynthetic Nerve Implant and the NeuroBlock devices developed in his laboratory. He is the recipient of the 2014 UTA College of Engineering Excellence in Research Award, the 2013 TechFortWorth Impact Award and “Ten Most Promising Life Science Company Award”, and the 2013 Tech Titans Award in Technology Innovation. María Alejandra González is a Research Associate in the Bioengineering department at the RNN Laboratory, she obtained her major as Biologist Pharmaceutical Chemist from the Autonomous University of Querétaro, México in 2006; she was involved in the field of forensic sciences as well as in projects of development and quality control in the pharmaceutical industry, where in addition she worked as internal auditor. Then she found in the Institute of Neurobiology, UNAM, México a high motivation in understanding how molecular and cellular mechanisms direct the neuronal and glial functionality and elucidating the structural and ultrastructural characteristics of these cells. She reported the expression of different subunits of GABA-A receptors as well as the presence of new cellular populations in the periventricular zone of cerebellum. In the same institution she obtained her MS in Neurobiology in 2011 and her PhD in Biomedical Sciences with honours in 2016. Now she moved forward to study Bioelectronic Medicine, that involves the use of electrical signals to modulate complex neuronal circuits by using medical devices, to find solutions to real health problems. She is convinced that working in a multidisciplinary way turns into powerful projects. 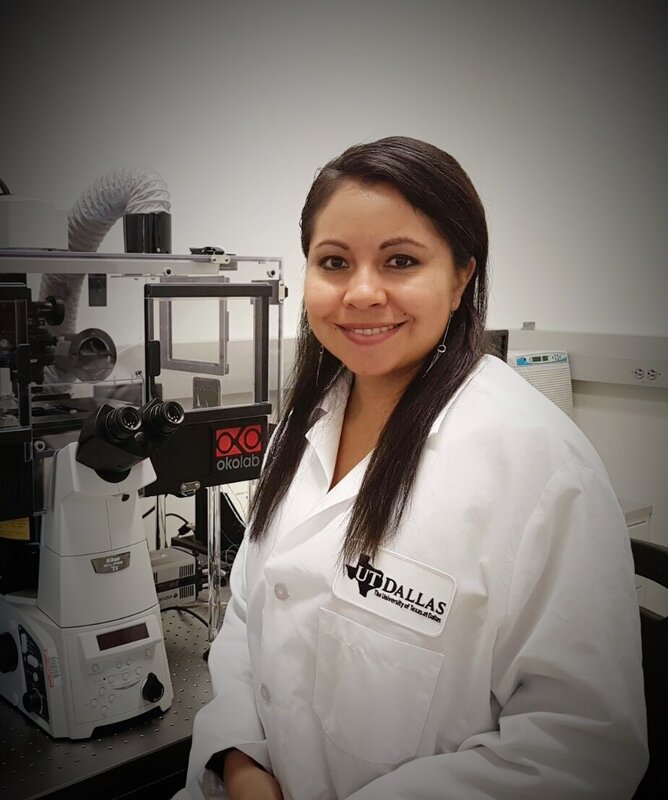 Geetanjali Bendale graduated with her Masters in Bioengineering from the University of Texas at Arlington, and is currently a PhD candidate in Bioengineering at the University of Texas at Dallas. Her current research focuses on nerve regeneration mechanisms and restoring functional recovery using bio-mimetic cues. ​Ana Hernandez-Reynoso received her Bachelor degree in Biomedical Engineering and Master of Science degree in Computer Science, both from the Monterrey Institute of Technology and Higher Education campus Guadalajara in Mexico. She is currently pursuing her Ph.D. in Biomedical Engineering at the University of Texas at Dallas. Her research focuses on wireless neural interfaces for urinary incontinence. Research Associate, Arog Pharmaceuticals, Dallas, TX. Postdoc, UTD. Neural Interfaces Lab. TX. ​Postdoct, Univ. of Florida. Judy's Lab. FL. Research Scientist. Life Technologies, CA. Postdoc, Baylor Univ. Sardiello’s Lab. TX. Research Associate ANS St. Jude Med. Medical Student. UTSW Dallas TX. PhD Student at University of Wollongong, Australia. Research Associate, UT San Antonio, TX. Res. Associate. Accenture Technology. TX. Green Fellowship at UT Southwestern. Dallas, TX.